In case you weren't aware, I totally *love* Flourishes! 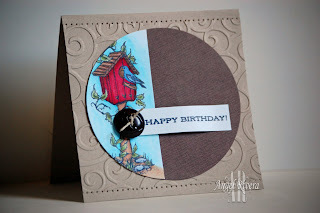 Their stamps, their dt, the company - they're just fab in my book! This week, they had a sketch as their weekly challenge. I didn't intend to have this image used as the left side of the circle, but once I colored it and cut it down, it was just too big for the middle of the sketch. I think you can click on the picture to get an up close look at the image. Coloring images is so therapeutic for me! The middle of the sentiment is popped up w/ a pop dot, that's why it looks like it's not flat, because, well, it's not! ;) Was going for that banner effect. I wanted to add something to the card base, so went w/ the swirly embossing folder and pierced on the top and bottom of the design.